Thermo Fisher Scientific Inc has launched a new split-free, nano-flow UHPLC system. The Thermo Scientific EASY-nLC 1000 is the newest addition to the EASY-nLC family of nano-LC products. The EASY-nLC 1000 is unique in its ability to facilitate dedicated separation of biomolecules, such as proteins and peptides, at ultra-high pressures. The instrument is extremely easy to use and can seamlessly integrate with the complete range of Thermo Scientific mass spectrometry (MS) systems for instant, trouble-free operation. The Thermo Scientific EASY-nLC 1000 uses shorter gradients on 50 µm UHPLC columns with 1.9 µm beads, delivering superior separation capability with razor-sharp peaks. As a result of its advanced design, the EASY-nLC 1000 facilitates as much as 30 percent more peptide and protein identifications by providing higher pressure ratings, along with independent and simultaneous variations of bead size and column length. Increasing the number of identifications is a significant achievement for proteomic research and discovery purposes. 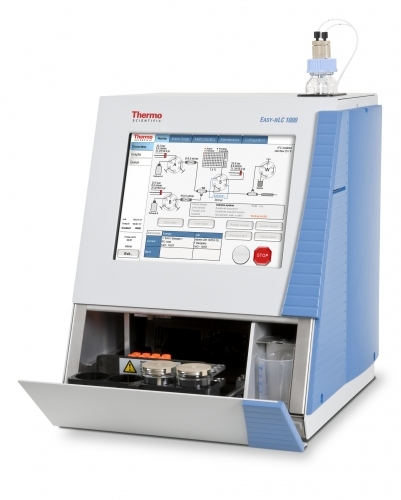 The EASY-nLC 1000 operates on the Thermo Scientific Xcalibur software platform, easily connecting and interfacing with the full suite of Thermo Scientific LC-MS systems. The higher operating pressure range of the EASY-nLC 1000 significantly shortens analytical cycles and is designed to increase productivity by accelerating sample loading and column re-equilibrations. Additionally, the split-free, nano-flow capability of the new system provides excellent retention-time reproducibility (below 0.4 per cent RSD), even for very complex samples. The simple integrated configuration is both easy-to-use and robust. For more information, visit www.thermoscientific.com/easylc. High blood pressure: are cases incorrectly diagnosed?